MAKE A REAL DIFFERENCE IN 2019. VOTE WITH YOUR WALLET FOR THE MINA CUP. The Mina menstrual cup is a nation-building solution with a proven track record. 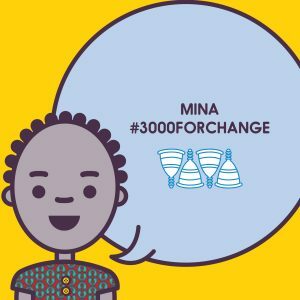 Regardless of your political leaning, by purchasing a Mina Cup for yourself or those in need, you’ll have a positive impact on yourself and your country. because periods currently lead to girls missing five school days a month on average. For every Mina Cup bought, another is donated to a disadvantaged schoolgirl. because unlike tampons and pads, the Mina Cup has no toxins which can be absorbed by the body. because the cup is only disposed of every five years, not once a month, and is made of eco-friendly materials. So, if you buy a Mina Cup today, you’ll only have to buy a new one when the next elections come around. because it’s locally produced, creating jobs here. Order your Mina Cup today. All deliveries of cups purchased in April and May will be made in June.